Welcome to the fourth step in our free professional learning series on personal blogging to help you set up your own personal or professional educator blog! Help you understand why commenting is an important part of your reflective blogging process. Help you connect with other educational bloggers. It’s an easy trap to focus too much on publishing your own posts. Reading other people’s posts and commenting on posts are very important parts of the learning process as a blogger. The idea of reflective blogging is you’re evaluating, reviewing, reflecting, revising while reading other people’s posts, commenting on their posts, writing your own posts, and commenting back on comments made by others on your own blog. By following this process you’re learning at a deeper level and differently from how you’ve learned previously; and you’re doing it as part of a community. Simply put — Blogging is about connecting with others! By default, comments are enabled on all newly created blogs, and a comment form will appear at the bottom of posts where readers can respond to what you’ve written. Approved comments are displayed under the individual post or page. You just click on the post title or the comment link to read the comments. Threaded comments allow readers to reply to other comments inline/nested which encourages better discussion and responses. 1. Click on the heading of the post you wish to comment on or the “comment” link at the top or at the bottom of the post. 2. Scroll down the page to the comment form or click on Reply (to reply to a specific comment). 3. Enter your name and email address – your email address is hidden and only the blogger sees it (If you are logged into your Edublogs account you won’t need to add these details). 6. 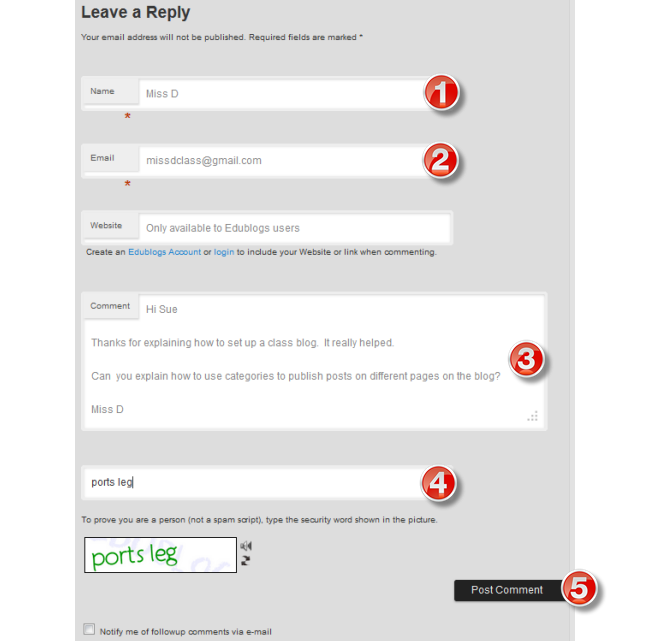 Select ‘Notify me of followup comments via e-mail‘ if you want to be notified by email of comments from other readers. Here is a PDF cheat sheet of the above instructions. Click on the ‘download’ button under the document if you want to save or print a copy. Where possible refer to the blogger or another commenter by their first name. Try to contribute new ideas to the conversation. Don’t comment if you are doing it just for self-promotion. Avoid being too negative. If you don’t agree say it in a nice way and provide an explanation of your alternative viewpoint. There are no rules to how long or short a comment should be. However, if it is a long comment think about if it is worth responding to by writing your own post in response. Respond back to comments on your own posts. It shows you value readers’ comments. Some educators also send an email reply to their commenters. This ensures the commenter receives your response and provides a more personalized experience –strengthening your PLN. Select to be notified of follow up comments if the option is available. This notifies you of follow up comments by email and makes it easier for you to respond back with further comments. Mobile devices and social networks have changed how we source the content we read. It’s also impacted on how we connect with others. We’re far more social now and more likely to use social network sites like Twitter, Facebook, and Google+ as a buffet. We can consume whatever we want at our leisure by selecting posts from links shared by our networks. To be an active part of the edublogosphere and make time to network with others via social media e.g. Twitter, Facebook, or Google+. Add social share tools like AddThis Social Share to make it easier for others to share your posts. Consider adding an email subscription widget to your blog or starting an email newsletter. We’ll talk more about these options in step 10 of this series. Twitter is one of the key network used by educators and where many educators source links to posts to read. If you aren’t using Twitter or don’t follow many educators on Twitter — now is the time to build up your Twitter network! You learn more about using Twitter here. The key to reading and responding to other peoples’ blog posts is finding effective strategies that make reading and commenting time efficient. There is a lot more personal preference in where we source our links from and how we choose to read the content. Some people prefer to read posts directly from Twitter, Facebook, and/or Google+ — dipping into the stream when they have time and knowing the more popular posts will be shared the most (so easily found). Sometimes people sign up for email newsletters from their favorite bloggers, while others subscribe to RSS using RSS readers like Feedly or Flipboard. We’re going to show you how to subscribe using RSS; and how to use both Feedly and Flipboard because these approaches make reading and commenting time efficient. I use Feedly for reading my blog subscriptions and Flipboard for sourcing links from my social networks. RSS is an acronym which stands for Really Simple Syndication. In simple terms, RSS is a simple and effective way of keeping in touch when new information is added to a website without having to visit the website to check for new updates. You subscribe to your favorite website using the RSS feed in an RSS feed reader such as Feedly. Whenever new information is added to the website it is automatically sent to your RSS feed reader where you can read it at your convenience. Blogs on all standard blogging platforms automatically include RSS feeds and don’t necessarily use words or an icon to indicate the presence of the RSS feed. For all Edublogs, the RSS feed is found by going to yourblog.edublogs.org/feed. RSS feed readers like Feedly automatically detect your RSS feed from your blog URL so there is no need to know the feed URL. RSS is automatically disabled on all private blogs to ensure only people who should be able to view the content of your blog are able to. There is a wide range of feed readers available and the most popular RSS Feed Reader currently is Feedly. The free version of Feedly allows you to follow up to 100 sources which should be enough to keep you busy! This short video by Joshua Essary explains how to get started with Feedly. Flipboard was originally designed as a social network aggregation, magazine-format app for iPad in 2010. It’s now the most popular of the magazine-like content aggregation apps. Flipboard’s strength is you are able to bring your social networks such as Facebook, Twitter, Instagram, Google+, LinkedIn into one location alongside your favorite news sources and anything else you like to read or watch (like YouTube). On top of this, it’s easy to share your favorite content with your social networks and easy to curate your favorite content into Flipboard magazine(s). Watch this video to learn more about Flipboard. The Edublogs team also uses Flipboard to curate magazines. For example, here is our Flipboard magazine from ISTE 2018. Refer to these instructions to set up and use Flipboard. 1. How do you enable comments on pages? Most our themes support comments on pages and, by default, comments are enabled on pages. 2. Locate the post or page you want to enable comments on. 3. Hover over its title to bring up its action menu and then click on Quick Edit. 4. Select ‘Allow Comments’ and then click on Update. 2. Why don’t comments display on pages? Most of our themes now support comments on pages, however, there are a few themes that don’t. If the theme you are using doesn’t support comments on pages, and you would like this feature, then you will need to use an alternative theme. 3. How do I make comments display on my homepage? Traditionally comments are designed to be displayed under a post and you view the comments by clicking on the post title or the comments link. It is done this way because posts can have hundreds of comments and displaying them directly under a post on the post page can make it hard to read the content. You can display comments by adding the Recent Comments widget to the sidebar. Comment: Visit someone else’s professional educator blog and leave a comment. Strike up a conversation — ask a question and see if they get back to you. Leave a comment here to tell us which blog you visited. Join Twitter: If you haven’t joined Twitter yet, head over to twitter.com and sign up. Leave a comment on this post with your Twitter username so others can follow you. If you’ve joined in the past, now could be a good time to review your account. Do you need to update your images or bio perhaps? Feedly or Flipboard: Set up Feedly and/or Flipboard. Refer to these instructions to set up and use Feedly or this information to use Flipboard. Here is a list of blogs you can subscribe to using Feedly. What are your favorite blogs to read and how do you stay up to date with them? What do you like/not like about Twitter, Feedly, or Flipboard? Also feel free to leave any questions you are having (or tips/advice) as well. How to leave a comment: Scroll down to find the comment box. Write your comment, then enter your name and email address (email addresses are not published). Enter the anti-spam word. Press submit and we will moderate your comment ASAP. I left a comment on my first post. I also liked exploring other people’s blogs. I enjoyed learning about different ways to connect with others but this step was a bit more challenging than the others. I left a comment on a blog about a science project and i’m providing the link below! I’m not a big twitter person but i created a page for the challenge. I will try to expand my social media use and explore it more. 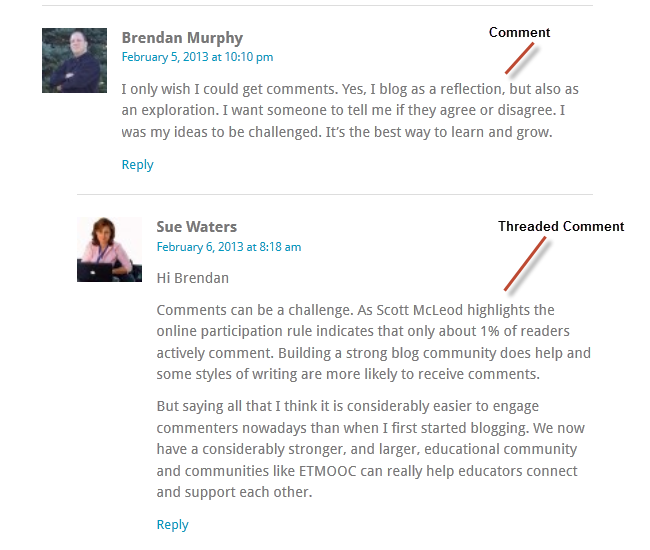 I posted a comment on Susan Straub’s edublog. I also asked a question…I hope she answers! I found you on Twitter! Just a tip to add a bio and avatar to your account when you get time as people will be much more likely to follow you. I hope Susan replies to you! This is an awesone way to reach out to other students and educators. For this step, I have added my LinkedIn account. It is a great way for future employers and colleagues to contact myself professionally. This is a great way to connect to people who are not only in your field but individuals with the same passion as you. It was great to see other ideas who share the same profession. This is a great way to connect to people who are not only in your field but individuals with the same passion as you. It was great to see other individuals thoughts and ideas who share the same profession. This was an great opportunity to reach out and connect to other people such as educators. This is another way to get to know about the education world. This is a great way to be able to reach out to other educators. It’s nice to be able to see teachers who are already in the field. This was an amazing way for me to be able to connect and reach out to other aspiring teachings. It was nice to be able to see other pre-service teachers. For this step, I entered in my professional facebook page. I have a professional facebook page for organizations at my college that I am a part of, and it is required for. It is just a nice and convent thing to have. I have chosen to set up a free account with Feedly. I am hoping that this will help me to find and connect with likeminded bloggers and educators who are passionate about providing the best physical education possible to primary aged students. For this step, I decided to join twitter. My twitter handle is at @kiataylor2045. I have used Twitter before but i figured that making a professional twitter for my future students and teachers would be beneficial. I like twitter because it is an easy way to connect with others and get out information quickly! I looked at one of his posts under his Education Week Teacher column. The post was on classroom management and it included excerpts from teachers on their biggest classroom management mistakes and things they should have done instead. As a future Early Childhood Educator, I really enjoyed reading the excerpts on this post as practicing my classroom management techniques is something that I am currently working on. I posted a comment thanking Larry for including the excerpts. I look forward to reading more blogs. I read a few blogs but one I love most is https://mathequalslove.blogspot.com/ . I follow Sarah as she also teaches math and is so generous with her thoughts and ideas. She is certainly one I look up as an educator. I also enjoy using Twitter. You can follow me on Twitter @deepdishpi. It’s nice to connect with other educators (esp math) that can offer advice and reassurance. Hi! My contact page contains the link to my Twitter page. I visited a friend’s professional blog and commented on her latest post. https://wonderingandwondering.wordpress.com/2019/01/29/why-is-it-so-hard-sol19/comment-page-1/#comment-2711 I also followed her page. This one has been the hardest for me. I’ve been so busy getting my own blog set up that I haven’t had time to make it over and checkout many others. Now that I’ve got mine ready to go, I’m going to spend some time this cold, wintery day visiting some of my blog “neighbors”! I always think that joining in a conversation is a really hard thing to do but I also know that if I don’t then no community is built. I particularly like one gardening blog that i follow that brings together people who want to share their Harvest Monday blog. He uses Mr Linky for other people to link their blogs and then we all go and comment on each other’s blog. I might just try this on my blog about children’s books. We could have a weekend read where we all share what we have read.